Today starts our newest challenge at 2 Crafty Critter Crazies and we're honored to have QKR Stampede as our sponsor. Since I'm on the QKR DT as well as the 2CCC DT, I was tickled to have an excuse to share cards that used QKR images two days in a row! and I put my sentiment into a circle. This adorable little mouse is "Hanging the Star" on the Christmas tree and the sentiment I used is also from QKR Stampede. I colored the image with ProMarkers, then cut it and the mat for it with simple, circle, dies from Spellbinders. I used additional circle dies from QuicKutz to cut the sentiment and its mat. The Spellbinders set just didn't have any dies that small. I found my well-worn "Linen" embossing folder and used it on the front of the card base before I wrapped diamond textured ribbon around it and added the hand-tied, sheer ribbon, bow. Both of those ribbons are from Really Reasonable Ribbon. I added two scraps of dp behind the image, both of which had been inked along the edges. For a final bit of embellishment, I added the three, pale green, pearls to the lower, left corner. 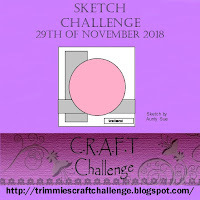 I really want to see you come and play in our "Anything Goes with a Critter" challenge this month. It runs from now until the end of the day on December 25th so there's plenty of time. The DT is taking a well deserved break so you may not get any comments on your entry but the challenge is up and running and we have a delightful sponsor so how can you lose? Pretty and cute all rolled into one. Love the design on this one also! Great sketch for that image. Oh that mouse is adorable, even though he is bigger then his Christmas tree!! So cute! A lovely card, fits our sketch challenge perfectly. 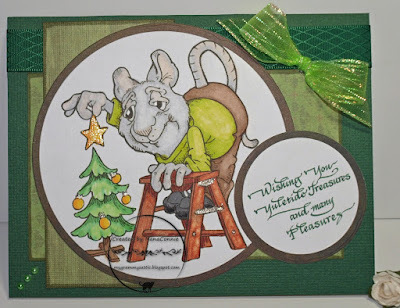 Lovely card adorable (is he a rat )great card anyway,thanks for joining us here at I Love Promarkers challenge good luck Lyn DT x.